There have been many good film versions of the Charles Dickens novella, A Christmas Carol. Several of them could even be called classics. Everyone from Bill Murray to James Earl Jones to Tori Spelling to Fredric March has taken a turn at playing a version of the famous miser who, after being visited by three ghosts on Christmas Eve, changes his ways and becomes the most generous man in London. This holiday season, I watched quite a few old TV shows and I was somewhat surprised to discover just how many sitcoms have featured an episode where one of the characters has A Christmas Carol-like experience. Though actually, I shouldn’t have been surprised. A Christmas Carol is a universal tale and it’s one that continues to be appealing 174 years after it was originally written. You don’t have to be rich, British, greedy, or even a man to relate to what Ebenezer Scrooge goes through. We’ve all be haunted by the past. We’ve all wondered what we’re missing out on in the present. And we all fear how we’ll be remembered in the future. In fact, I would say that A Christmas Carol is probably as close to perfect you can get. The only problem is that Bob Cratchit’s son is named Tiny Tim and any work of fiction that features a character named Tiny has to be docked a few points. With all that said, my favorite film version of A Christmas Carol is the 1970 musical, Scrooge. Scrooge sticks to the original details of the story. Ebenezer Scrooge is played by Albert Finney. (Finney was only 34 when he made Scrooge but was made up so that he looked closer to 120.) The men, women, and spirits in Scrooge’s life are all played by a collection of distinguished British thespians. Edith Evans is the stately Ghost of Christmas Past. Kenneth More is the Ghost of Christmas Present, a decadent figure who drinks wine and travels around with two frightening-looking children. Alec Guinness is a heavily chained Jacob Marley and he plays the role with just the right combination of sarcasm and concern. (“No one else wanted to come,” Marley says when he greets Scrooge at the entrance of Hell.) An actor named Paddy Stone is credited as playing the silent and shrouded Ghost of Christmas Future. Let me just say that the Ghost of Christmas Future always scares me to death whenever I watch Scrooge. I imagine little children in the 70s were traumatized by his skeletal visage. What sets Scrooge apart is that it has singing and dancing! That’s right, this is a musical version of A Christmas Carol, featuring songs composed by Leslie Bricusse. Now, the overall quality of the songs is open to debate. There’s 11 of them and really, only three of the songs are particularly memorable. (Those songs are: I Like Life, I Hate People, and the Oscar-nominated Thank You Very Much.) But, honestly, who cares? The cast performs them with so much energy and enthusiasm that it’s impossible not to get swept up in it all. Scrooge is an outstanding production of a timeless tale. It came on TV at least four different times this holiday season and I watched each time. And I’ll do the same next year! 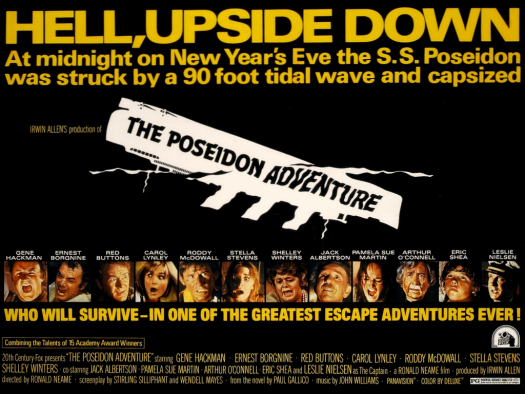 A few years ago, when I first told Arleigh that I had recently watched the 1972 film The Poseidon Adventure, I remember him as being a bit shocked and amazed that I had made it through the entire film. This was because Arleigh knows that I have a morbid obsession with drowning and that the mere sight of someone struggling underwater is enough to send me into a panic attack. 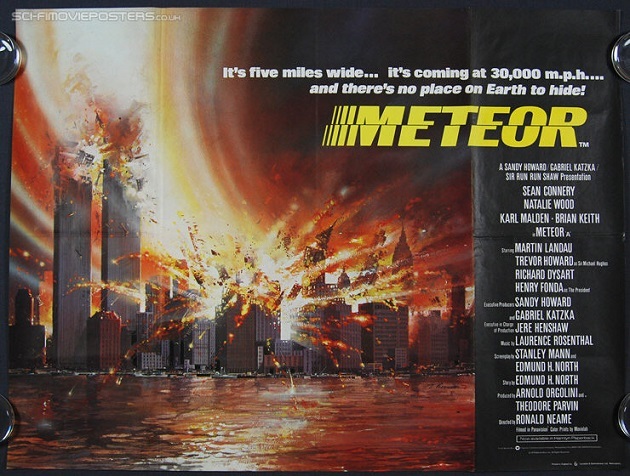 And The Poseidon Adventure is a film that is totally about drowning. The majority of the cast drowns over the course of the film. The few who survive spend all of their time trying not to drown. The main villain in The Poseidon Adventure is the ocean. The Poseidon Adventure is a film specifically designed to terrify aquaphobes like me. And there are certain parts of The Poseidon Adventure that freaked me out when I first watched it and which continue to freak me out whenever I rewatch it. For instance, just the film’s plot freaks me out. On New Year’s Day, an ocean liner is capsized by a huge tidal wave. With the boat upside down, a small group of survivors struggle to make their way up to the hull where, hopefully, they might be rescued. That involves a lot of fighting, arguing, climbing, and drowning. It freaks me out whenever I see the huge tidal wave crash into the bridge and drown Captain Leslie Nielsen. That’s largely because it’s impossible for me to look at Leslie Nielsen without smiling. (I’ve already written about my reaction to seeing him in the original Prom Night.) When he suddenly drowns, it’s not funny at all. It freaks me out when Roddy McDowall plunges to his death because who wants to see Roddy McDowall die? Whenever I see him in an old movie, he always come across as being such a super nice guy. (Except in Cleopatra, of course…) Plus, Roddy had an absolutely chilling death scream. They need to replace the Wilhelm Scream with the Roddy Scream. It freaks me out when survivor Shelley Winters has a heart attack right after swimming from one part of the ship to another. Because seriously, Shelley totally deserved the Oscar nomination that she got for this film. And it really freaks me out when Stella Stevens plunges to her death because I related to Stella’s character. Stella was tough, she didn’t take any crap from anyone, and she still didn’t make it. If Stella Stevens can’t make it, what hope would there be for me? And yet, at the same time, The Poseidon Adventure is such an entertaining film that I’m willing to be freaked out. The Poseidon Adventure was one of the first of the classic disaster films and it’s so well done that even the parts of the film that don’t work somehow do work. For instance, Gene Hackman plays the Rev. Frank Scott, the leader of the group of survivors. And Hackman, who can legitimately be called one of the best actors ever, gives an absolutely terrible performance. His performance is amazingly shrill and totally lacking in nuance. When, toward the end of the film, he starts to angrily yell at God, you actually feel sorry for God. And yet, Hackman’s terrible performance somehow works perfectly for the film. It’s such an over-the-top performance that it sets the tone for the whole film. The Poseidon Adventure is an over-the-top film and, if Hackman had invested his character with any sort of nuance, the film would not have worked as well as it did. And then there’s Ernest Borgnine, who plays Stella Stevens’s husband. Borgnine spends the entire film arguing with Gene Hackman. Whenever something bad happens, Borgnine starts acting like Edward G. Robinson in The Ten Commandments. He never actually says, “Where is your God now! ?” but it wouldn’t have been inappropriate if he had. And yet, again, it’s exactly the type of performance that a film like this needs. And finally, there’s that theme song. “There has to be a morning after…” It won an Oscar, defeating Strange Are The Ways Of Love from The Stepmother. And is it a good song? No, not really. It’s incredibly vapid and, while it does get stuck in your head, you don’t necessarily want it there. But you know what? It’s the perfect song for this film. The Poseidon Adventure is not a deep film, regardless of how many times Hackman and Borgnine argue about the role of God in the disaster. It’s an amazingly shallow film about people drowning. But it’s so well-made and so perfectly manipulative that you can’t help but be entertained. The Poseidon Adventure totally freaks me out. But I will probably always be willing to find time to watch it.